Etched Traumas proudly presents Korpinkorva EP. Korpinkorva is a four-piece audio journey through life plagued by mental disorder. Blending acoustic instrumentation, organic field recordings, sung and spoken vocals with noise and sound manipulation, it takes the listener deep into the subconscious of Utu Lautturi. Doom, anxiety and desolation merge with fragile moments of hope in an esoteric soundscape. All along building a strong sense of communion with nature. Sounds and lyrics inspired by the ever-flowing cycle of atomic re-arrangement…the daunting, yet invigorating experience of being one with a chaotic, hostile, murdering universe…how it all binds a broken mind into wells of despair and struggle, yet invokes courage and relentlessness in the face of personal demise. Korpinkorva is an attempt in making auditive sense of the senseless things within. It is a up-close and intimate reflective pool which hopefully reflects back when dipped deep enough into. Recorded and compiled in various locations, remote and homely, in Finland during 2009-2012. 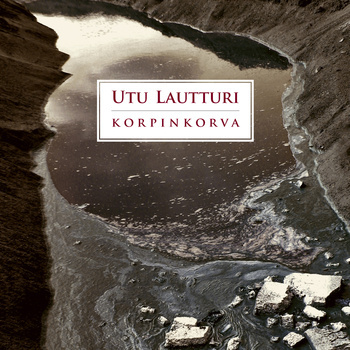 All musical and vocal arrangements by Utu Lautturi. Acoustic guitar improvisation on Kevään syö veri by Antti Silventoinen. Lyrics and spoken word on Näin lähden by Jaakko Huotari. In a desperate attempt to transform flesh into sound, Utu Lautturi was born. To force the shattered shards of a broken mind into audible reflective surfaces and summon guides in the endeavor of hermetic re-creation. Produced by whatever means, when and wherever, unrestrained by genre or method, Utu Lautturi’s sounds are a second skin. It is difficult to separate sound and word from man. All of his work relies on improvisation, snipping shadows off moments gone, and arduously attempting to compile them again into something vaguely familiar. Something to rest on and reach inside from. For if there is something sacred to Utu Lautturi, be it muddy and foul or gleaming pure, it must be imagination. This entry was posted in News and tagged anxiety, desolation, Doom, esoteric, finland, Hermansson, Huotari, Korpinkorva, mental disorder, Nature, Silventoinen, soundscape, Utu Lautturi by bsom. Bookmark the permalink.